At the beginning of this season I began by inventorying the seed and culling a lot of old and miscellaneous seeds. This task was to help formulate the seed order, but also gave the whole process a fresh start. We then looked at maps of last season’s crop rotation and quickly established the fields we would be using this year. Collards and kohlrabi found a more permanent spot in our field crop, but for the most part, the previous year’s crop plan was applied to this season. After establishing how many beds we would need, calculating the amount of seed needed is pretty straight for ward when you have previous year’s data. Ultimately, more seeds will need to be ordered at some point, and the plan will take on some minor changes. Planting our first vegetable succession in the Big Garden Beds is an example of adapting the plan to use the ground available to us. The field beds we had prepared the year before for this spring were far too wet. So instead we planted them intensively in our permanent raised beds. The crops did great and even though the leeks stayed nearly all season, they did not disrupt our usually carrot and salad greens rotation in these beds. The most notable aspect of planting this season was continuing and expanding our experimentation with our field crop production. For the past two seasons we have been planting our tomatoes into what we’ve dubbed this year “Favorable Furrows”. Kyle describes the method clearly in his planting summary; in addition to a challenge we faced using it that season. This year we also used this method to plant one of our vegetable successions. The results were great. The plants were quite vigorous and beautiful, and the weed/grass pressure was very manageable. This is achieved by rototilling the pathways with the BCS. Each row got a pass down and back with the BCS hugging up as close to the crops as possible. Some of the pathways between the crops were treated three times and some only once. The pathways treated thrice had best results, but the crops were big enough that I was concerned about damaging them. The rototilling was done in second gear. The quicker pace prevented the BCS from tilling to deep. It did a great job of chopping up the vegetation just on the surface and leaving the soil and thus seed bank relatively undisturbed. The only spots that new weeds really shot up was right next to the crops in the furrow itself, but these pulled easily when a little bigger. Hand weeding was done only once and fairly quickly. In the future one might fit a scuffle hoeing not long after transplanting. Interested in hand tools, I tried a grass whip to knock back some later growth in the pathways. It worked ok as far as effort and efficiency, but ultimately wasn’t quite right enough. I suspect there is a better tool out there for this kind of work. Particularly exciting aspects of this method was the reduction in time and equipment. Harvesting the cover crop for stray was done as usual. Then the riding mower was used to clearly cut out the field as low as we could. The furrow was ripped with a center shank on our IH 140. The goal is a trench as deep as the shank and roughly two shanks wide. This was done with a couple passes up and back. I found it helpful to try and get the shank just deep enough to peel the grass out of the way on the first pass. Subsequent passes shaped out the furrow and with moderate speed most soil was kept in or close to the furrow instead of it being thrown out far to the sides. Beginning a small scale farm, the low horse power cultivating tractor and BCS combo used to selectively prepare planting space might be a more accessible start to field crops then the equipment needed to prepare the entire field. With our standard field bed preparation, we use four tractors, some of which need to be much stronger and heavier. Recently, Mike presented me an article he found about deep zone tillage. After just briefly looking into I found examples of people using similar methods. So, we are looking forward to experimenting and improving in the seasons to come. We were also constructing a new high tunnel through out the season with intention of growing more tomatoes. It was quite the building project and learning process for the whole crew. We managed to get the tomatoes in by the 15th of July, and raced to finish our end-walls before the frost eventually came. The trellising presented some problems and irrigating needed some fine tuning, but the plants did very well in the new production area putting out big beautiful fruits. Additionally our cover cropping went well and as predicted this year. Most of the fields being seeded were close and somewhat in line with each other, making the process pretty easy. 3/27 – First greens planted in green house – Needs about 2 weeks sooner. 5/16 – Green house tomatoes – crew planting intro. 10/3 – Last field succession – Needs to be one Moon cycle sooner. 10/23 – Last Green House planting/ veggies – Needs about 2 weeks sooner. Focusing on planting has broadened the scope of my actions during the season. I was able to see clearly how each action or step informs the next: The crop plan and seed inventory leading to a seed order, having transplants depending upon the green house order forms being made and filled, the planting depending on the bed preparations, and ultimately it all coming together to form the products we take to market and support the farm. The process has been an exciting and intriguing part of the season, and has rounded out my understanding of the elements to farming. This concludes my third year, and thus fulfills my internship at North Slope Farm. Having had no prior experience, I’ve learned everything needed to further pursue farming as a means to a very fruitful livelihood. The seeds have been planted and the vision I hold of my future has been greatly expanded through the time spent on this land and being apart of this farm. It has highlighted the dynamic rhythms of nature and solidified my desire to actively engage its intricate unending flow. The lessons to be gleaned are life long. Finally, the amount of amazing people I have met and the lasting friendships formed at North Slope farm, other farms, and in the this area through all sorts of different gatherings have been truly inspiring. I am grateful for the opportunity to be apart of a community and the future they are working so hard to grow. General Observations: Log indicates both beautiful sunny days and rainy days in addition to some frosted mornings. Cover cropping is priority, and the tomatoes hang in until the 29th. On 10/10 the bunkhouse fire is first lit for fall! Equipment (20.5 hrs): Standard bed forming practices utilized the IH140 and the 265. Some cultivating was done with the Williams tool bar on the 265. Cover crop planting required the disc harrow on the Ford and the broadcast spreader on the John Deere. The late Kubota fulfilled this months mowing duties. Administration (53 hrs): Organic inspection on 10/4. Our use of conventionally grown strawberry seedlings changed the 579 field from certified organic to transitional until 10/1/2016. Because this space is used primarily to grow our flowers, the re-designation did not disrupt our production. Additionally, the season’s soil samples revealed high levels of Phosphorus. Mike caught up on some admin back log, paying bills, going through e-mails, and some website tune-up. With the end of the season almost in sight, he did the numbers from market and set the goal of maintaining $5,000 gross per week. Infrastructure (55 hrs): Chickens are cared for and moved. General cleanup, chores, and some mowing and work on the Kubota are also logged. By the 26th, freezing nightly temperatures required draining of our irrigation system at the end of the day. Some downed trees from storms past are pulled from the woodlot for firewood. The tomato field is finally broken down on 10/29. Greenhouse (.5hrs): Space is cleared for tea drying, Kyle works on microgreens, and potted trees are moved indoors. Composting (9 hrs): The last beds of 2013 are composted for planting! Planting (59.5hrs): In the BGB’s we followed the regular planting schedule of our salad mix successions, tatsoi, radishes and arugula. In addition the last couple field beds are prepared and planted. Cover crop is a priority during this month. Fields are all prepped with disc harrow and/or Williams tool bar. The beds that were formed for the beginnings of next season are sown with winter kill oats using an over the shoulder broadcast speeder; all others use a broadcast spreader on the back of the John Deere. A double batch that covers two fields consists of 4 bags rye, 2 bags peas, and one bad vetch. Both peas and vetch were not inoculated. The fields are seeded on the third and on the 15th they are thick with rye. Cover crop is also seeded into pathways of last remaining crops. Second round of seeding is completed on the 30th in the tomato field. Crop Care (130 hrs): Irrigation rotation is maintained through dry conditions. BGB’s get tuned-up by mowing, hand weeding, and scuffle hoeing. Crops are covered in preparation for frost forecast, which happens on the 10/24. Harvesting (246 hrs): Regular harvests were observed, occasionally delayed by frost. Additionally there was a second large harvesting of lemon verbena for tea filling eight of the green house tables. On a rainy harvest day the crew took comfort in coffee and doughnuts by the first of the late season bunk house fires! Handling (61.5 hrs): Regular handling practices were performed. In addition we harvested, dried and bagged the lemon verbena tea. Marketing (120.5 hrs): We recorded both slow and busy days at market through October. This shared the pattern with the weather. With the tomatoes lasting almost to the end of the month, we were able make two runs to the processor for making sauce. Special Projects (4 hrs): Kyle moved micro greens to the seedling gothic on 10/21, set up heat mats for basil micros, and spent some time working on the general set up. Week 2: Rainy, some sun. Week 3: Threat of rain. Touch o’ frost. Intent: My intentions at North Slope Farm from the begging have been to grow my personal skills and know-how through what I find to be inherently rewarding work relevant to my long term goals. I am excited to be focusing on planting this year, which falls in line with my interests in farming. With planting I can focus on the rhythms of the season which help to establish the pacing of our successions. I intend to gain a clearer understanding of the steps involved with developing and executing a crop plan. Tasks and Responsibilities: I am tasked with establishing our crop plan for the season and placing our seed order, keeping us up with the planting dates and moon cycles, and providing our green house with order forms for each succession. I expect to be doing more work on the tractors. In particular, tasks involved in preparing the beds for planting such as primary tillage, bed forming, tractor cultivation, and eventually cover cropping. Finally I will compile the information gathered from my focus into a clear summary for future reference. This year as my focus I endeavored to engage myself in North Slope Farm’s Administrative duties. In my personal life I only have to perform these sorts of tasks in a minimal way. The farm has a well established and fairly clear way of organizing itself. Because of this, standard procedures have been formed for paying bills and capturing information. The work done during this focus has met the expectations expressed in my introduction, and has expanded my view of the farm. The Administrative tasks that I was most involved dealt with the finances. This included recording the market cash and other deposits, paying the bills, employees, taxes, and various other expenses, of which there were a few that stand out. 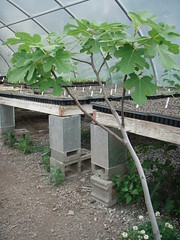 These include equipment repairs, new green house plastic, Cow Pots, and our Bio Bags for market. These expenses are notable because they are not part of the monthly or weekly expenses such as payroll. There are more and more varied purchases during the beginning of the season. I also was able to fill out our annual organic certification update form. Colleen had completed the exhaustive application last year. So this year I only had to convey the same information as our practices have not changed since then. The employees pay checks and bills were the most straight forward and familiar to me. These items form a rather regular expense to the farm and thus a rather regular schedule of paying. Pay day being every other Tuesday meant that this was also the day I would spend the afternoon in the office. Before writing any checks I would first reconcile our ledger with the bank statement. This would almost always take me some time. Not because the task is difficult but because I would have to do it several times before it came out right and I was sure of my math! Though it could be time consuming, sussing out any discrepancies can be gratifying. Ultimately any problems that occurred here were easily resolved. If we had not received a bank statement then reconciling was not done. After that I would add up each employee’s hours and enter them into our QuickBooks, which calculated the individuals pay for me. I would then write their checks which mike would later sign. The bills followed a similar procedure and would often be done the same time as payroll. The bills however, did not require me to use Quick Books or the computer. I had to make sure correct payment on correct invoices. After paying each bill I would write the date and check number on the statement and file it in the appropriate location in the large red accordion file that sits atop the admin desk. The taxes are an area that I am truly unfamiliar with. The taxes to me seem a complicate and somewhat overwhelming subject. Mike and I would complete these tasks together, and having gone through the process of paying them a few times has helped bring it into perspective. Paying the taxes and fees has been made relatively easy on-line; it is a matter of Staying current and having the right information to plug into to correct forms. This again is greatly aided by the established qualities of North Slope. We pull our paper files for paying taxes. Then we export pertinent information from QuickBooks into a summary to excel spread sheets. After that we follow the steps of the websites. Some sort of confirmation of payment is provided, and this we make sure to add to our files. General Observations: first notations in log for the month are of the after math of Hurricane Sandy at the end of October. Eventually clean up began. Comparatively the farm did ok through the storm. Mostly it brought wind that wreaked some havoc on the green house plastic, but damages were minimal overall. The pace of the remaining work and harvests slowed considerably. There were many shorter days, some very cold and less tasks to occupy a crew. Administration 18.5 hrs: Kyle sustained a minor injury. Some of his teeth were chipped when a heavy-duty pin dropped, striking his face while replacing the tow bar on the Ford. The notes include the medical treatment and the farm insurance. We had a meeting around the bunkhouse fire on the 27th to talk about the concluding season, the season to come, and the remaining tasks. On 11/28 there are notes about the increase in minimum wage. The regular payroll and bills practices are observed, amongst the compiling of data, and posting summaries. Seed order for 2013 is list as to do. Infrastructure 39.5 hrs: Sandy knocked out the power from 10/30 until 11/11. on the twelth the water pump at the ranch was fixed. Chicken chores, storm clean up and repair, and end of season/winter readiness are all the tasks at hand. Storm “lessons learned” as logged include: Generator, at least three days of fuel, drinking water containers filled and stowed, and water for toilets. Also a note for catchment and hand pump as future options. The plastic on the ends of Ralph’s house were secured with staples through drip tape. Repairs attempted on rips in seedling green house. Some wind damage to small wood frame green house was repaired. The chickens required moving to new locations, fresh hay, and food and water. Along with taking care of the birds our newly residing cats needed care for their first winter in the seed shed. The cats have been named “Agua” (female), “Silky” (male, long hair), and “Skunk” (male, short hair). “Skunk” was later renamed “Ghost” do to his illusiveness and evading capture. Row cover is collected along with hoops and sand bags. There is notation on the 18th for draining the water system over night, and later the heater in the barn attic was turned on the prevent pipe freezing. Some time snow shoveling is also logged. 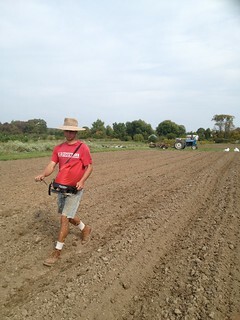 Planting 0 hrs: On 11/6 the last field (tomato field) for cover crop was prepared and seeded by Rita and Kyle. The flower field was also broad cast with cover crop then mowed, leaving the chaff as cover. Crop Care 15 hrs: 11/14 Protected hazel nut and apple trees. The trunks were being nibbled. Handling 35.5 hrs: crops could not be washed during power outage. As mentioned the last harvest weather was particularly cold. The task of washing took Mike into the night, having to be resumed the following day. Marketing 52 hrs: On the 3rd some roads are still closed on the way to a slow and cold market. On 11/10 Colleen goes to Gravity hill market with tea! The last two markets are both indicated as having been busy and a good end to the season, with excellent weather. At summit it is noted that we ran out too early of mushrooms and cider. Special Projects 10 hrs: 11/19 Cedar post harvest as part of the wood lot management plan. The harvested cedar is to be used as fence posts around the fruit cluster and a small post and beam structure to be built in the same location. 11/20 Mike heads into the east woods for clearing dead falls. The log states the goal of establishing access lane and thinning deciduous trees to allow remaining cedar to reseed and establish a new stand. ATV worked well with the trailer in the logging configuration. Week 1: After the hurricane, wet, cold. Week 2: Cold, windy. Forecast Nor’easter. Hard freeze. Warm for weekend. Week 3: Saturated, rainy, cool. Cold days, freezing at night. Week 5: mild sunny day, just freezing at night. 11/27 Snow! Of all the key elements that North Slope farm is broken down into, Administration, is the one that I am drawn to the least. That is why I have taken the opportunity to make it my second year focus. It is my intention to gain a basic understanding of the administrative tasks of North Slope Farm. In doing so, I will be cultivating my relationship to these less exciting, but necessary aspects of managing a farm or small business. I expect that this focus will bolster my confidence for engaging in similar tasks in the future. Balancing the check book, payroll, paying bills, record keeping, compiling data, data entry, filling out forms, filing paperwork, messages, email, general office upkeep, and much more that I’m sure remains to be seen. Irrigation is yet another integral part of our farm operation. Unless there is a good rain fall, irrigation management is a daily task that follows a flexible weekly rotation based on areas of highest priority. The farm is divided into blocks that reflect the maximum amount of watering achievable within the operational pressure. A block is watered for a determined amount of time before being turned off and moving to the next. Within these blocks, there are basically three ways that we set up lines to accomplish our watering needs. All lines follow this order: the well pump to the main lines, main lines to sub-main lines, sub-main lines to drip lines. 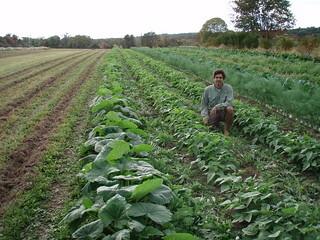 Field crops: 200 foot beds each planted with two rows. A single line of drip tape is used for these beds. 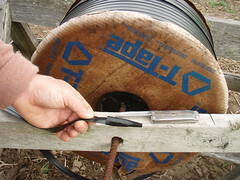 A spool of drip tape is held horizontally in a wooden stand on a piece of rebar. It is stationed at the start of the bed and the line is pulled from this down the middle of the two crop rows to the far end. Attention is given that the tape is tucked beneath all plants. The tail end is then capped by cutting a section of the drip tape two to three inches long to act as a sleeve. The new end of the line is then folded over a couple times and inserted it into the sleeve (see picture). These lines are then secured to a thumb valve in the sub-main. Our flowers in the “579 field” also require only one line of drip tape. Big garden beds: 100 foot permanent raised beds usually very tightly planted. For these five lines of drip tube are used. This task is most easily accomplished with two people, starting with the center line and working outward to either side. One person at each end pulls the line taught then lays it straight and evenly spaced down the length of the bed. These lines are secured to a thumb valve in the sub-main and capped on the end with a plastic end cap. This could be a pressure valve that bleeds the line and automatically closes or a repurposed thumb valve. There are two beds of fruit trees, black berries, and asparagus. Each has two lines of drip tube that are treated the same way. Green houses: We have two green houses for production, one 50 feet long the other 75. Each has four beds typically planted with two rows each and trellising down the middle. Two lines of drip tube are laid just outside of each crop, secured to a thumb valve in the sub-main, and capped with plastic end caps. Again this could be a pressure valve or a thumb valve. Our strawberry beds and the permanent beds in the “corner garden” area share the same configuration of two lines of drip tube. The well pump is turned on at the begging of the season and off at the end. The main line always remains in the same location. Sub-main lines along with the drip tubes are disconnected and stored together in the fields over winter. These lines are reassembled as we proceed through the planting secessions. When the season is in full swing the lines move very little, so irrigation is a matter of turning the correct valves on and off in the appropriate timing and making any repairs. Starting in the morning the main valve is turned on. This comes directly from the well. When starting a block the sub-main line is connected to the main line. All of the desired thumb valves are opened and the undesired valves are closed. Finally the valve from the sub-main to main line is opened. The lines will fill with water and begin to drip. It will take a few minutes for the system to pressurize and some air will be forced out of the end. The very end of all the lines must be checked for full pressure. Steady dripping can be seen at these furthest points. If all lines are functioning properly then the pressure gage at the sub-main main line connection is read and this information is recorded in the log along with the date, location, and duration. This log also contains any rainfall data that we have collected, which plays a role in our rotation. If the line fails to pressurize and begin dripping, it is then walked backwards to the beginning. In this process all connections and valves are checked, along with checking for any holes or damages. The issue usually become obvious and is promptly resolved. Watering in the seedling greenhouse is typically done manually by the green house manager. This will result temporarily in a lower pressure reading but will not greatly disturb the irrigation rotation. If pressure still cannot be achieved and all lines have been checked and rechecked, then it could be that water is being used somewhere else however irrigation is usually given priority. The worst case scenario in the irrigation system would be a failure of the well pump. I did not experience anything like this. On the more sophisticated side we have used water sensors that are buried in specific locations around the farm. Most times though, the soil moisture is assessed by picking a representative spot for a specific watering block, digging down a few inches to retrieve some soil, and pressing it between your fore finger and thumb. Damage to irrigation will make its self known when turning on the water and walking the lines. Often the damage can either be seen or heard. All repairs are rather easy; it is a matter of assessing the damage and making the fewest and most affective repairs or alterations. Simpler is better. After that it comes down to timeliness for rejoining the crew with the other tasks at hand. Holes in lines are cut out and replaced with sections of new line where necessary and spliced together with an inline connecter. Often cutting out the hole and putting an inline connecter will fix it without having to add new drip tube or tape. Most damage is due to the mower hitting lines, no irrigation components will withstand this. It is most common that the mower may take off the end caps of lines in the big garden beds, or hit lines that have been moved or stored in vulnerable locations. It is less common that the mower should hit component of a main or sub main. Repair requires removing damaged sections of lines or fixtures and replacing them. The weed-wacker will break the red tabs on the thumb valves and the pressure gauges. The sun will also make the plastic tabs brittle. One way or another they will eventually break off. They will still be usable but it is important to note that the plastic can be sharp enough to cut ones figure when turning on an off. We prolong the life of thumb valves by using them as end caps when they are too difficult to turn. Drip tape is far more easily damaged than drip tube. This most commonly occurs during harvesting with the harvest knives. This year an interesting issue was the amount of small holes chewed by animals in the drip tape of our furthest field. This happened during the hottest and driest time of the summer. 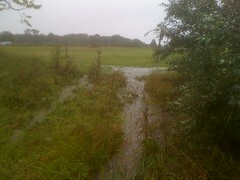 We attempted to address it by providing water for the wildlife is an old sink that we set up on the edge of this field. Many of these lines still required repeatedly repaired. Hardware: Main ball valves, aluminum quick connects and end caps, thumb valve, end caps, in line connects, pressure gage, main valve, hose clamps, 1” and ¾” plastic elbows, tee’s, reducers, and end plugs. Tools: The tools consist of a utility knife, a hexagonal head screw driver for the hose clamps, the hole punch for adding thumb valves to sub main lines, and a roll of Teflon tape. These items are always carried in a small “job bucket”, hardware is added according to task. Timing is important. I have forgotten and turned off irrigation late. This resulted in some flooding. Thankfully it was never too bad. On the other hand, by the time we are done transplanting a row in the fields in the middle of summer, all the plants look pretty wilted and sad. Irrigation must be available for them right away. By the time that they are turned off, they are standing up looking much happier and eager in their new homes. Also, turning the well pump on and off gives a clear sense of begging and ending to the season. General Observations: Late in August hurricane Irene left conditions saturated. September brought additional rainy weather and flood watches. Days of heavy rain forced work inside, extended a crew lunch noted in the log, and cut some days short. However, work pressed on with regular harvesting, crop care, some final planting, and other weather permitting tasks. Green house production continued, and the 6th Annual Tomato Fight was held on the 4th of the month! Administration 61 hrs: Regular payroll, money handling, and bill paying. Organic inspection on the 7th followed by detailed notes in the log of clarifications, questions and things to specify. Email reply to trainee applicants on the 27th. Kyle took a test drive with Mike to Solebury Orchards to pick up fruit as training to operate the box truck. Infrastructure 50 hrs: All diversions and water ways were mowed at the beginning of the month, as well as on going mowing of the fence lines and field perimeters. Chicken coops were moved in rotation of fallow field locations. Equipment 11 hrs: Kubota blades were sharpened for use. A pin broke on the fly wheel of the hay baler due to too much hay at too fast a rate. The repair was easy and all materials were on hand, resulting in a fun experience. Greenhouse 6 hrs: Green houses were cleaned and planted and seedlings were thinned. Composting 8 hrs: No specific notes. Planting 18 hrs: Big garden beds were composted, broad forked, tilled, and seeded with salad. Rain on the 21st changed plan for direct seeding Swiss chard and scallions to transplanting. Ralphs House green house was direct seeded with beans, radish, kale, and chard. Radishes were seeded next to the existing tomatoes in the Farm House Gothic green house. Crop Care 119 hrs: Plenty of hoeing and hand weeding in the big garden beds and field crops. Poor germination and growth was noted in the big garden beds for spinach. The two southern strawberry beds were weeded and heavily mulched. On the 28th the green house tomatoes and the yard long bean trellis were cleaned out for replanting. Beans were set to soak over night and be inoculated just before putting in the ground. Harvesting 238 hrs: Weekly harvests of hardy greens, salad mix, and tomatoes are noted through the month for market; in addition summer squash, scallions, peppers, green beans, egg plant, beets, tat soi, flowers, herbs and garlic were also available. On the 21st arugula was uncovered from Remay for its first harvest and noted as looking nice with no damage from flea beetles. Butternut squash was harvested and placed in the green house to cure, and acorn squash was placed in storage in the seed shed. Unfortunately on the 24th lemon balm harvested for tea went bad during drying. Low yields noted on Green house tomatoes and at the end of the month the yield was low on chard and kale due to fungus. Hay was cut raked and bailed during the first week of September with a decent yield. Handling 84 hrs: hardy greens washed and salad washed and bagged for market Scallions and beets get sprayed off. General Observations: From the log the weather appeared to be what one would expect, remaining cold with some rain and snow at times. Despite that it seems to have been a busy and productive start to the season. Administration 204 hours: Lots of meeting and discussion of the season to come, establishing plans, tasks and goals. In addition there a good deal of introduction and demonstration of different farming elements for interns. Efforts to find a consistent measure for recording crop data. Infrastructure 112 hours: General winter repair, clean up, and organization was begun. Chicken chores were done regularly in addition to some work done on their coops. Casey’s Sandbox was shored up. Electric fence was repaired. Cut rebar for hoops to cover strawberries. Fence was extended to included market garden. Gate was built for Madonna Field, fence was tightened, and a failed post was replaced. The Hens were collected after a fence post had fallen. Greenhouse 125 hours: Introduction and review of green house systems. Seed inventory, seeding and planting to field dates were all discussed. A few rat holes needed to be filled on either side of green house. Heat mats were turned on (3/10) for herbs and flowers. Small beds were moved out and replaced with larger ones. Attention was given to weeding, preparation, and watering of green house beds. First group planting on the 3rd. Parsley, chard, kale, scallions, and squash were seeded. Tomatoes for greenhouse and tomatoes, peppers, and eggplant for seedling sale were all seeded. Squash was eaten and measures were taken to prevent recurrence. Tomatoes were potted for green house and for sale. Composting 6 hours: Sifted as needed. Planting 2 hours: Peas were inoculated and planted in Ralph’s House. An attempt was made to “frost seed” clover. Crop Care 259 hours: Lots of weeding and preparation of beds in Farmhouse Gothic, Ralph’s house, tea garden and strawberries. Remay was cleared from fields and rated on reusability. Field tunnels were tightened, strawberries were covered with Remay and trenches were dug to help drain fields. Asparagus was cut back. Demonstration and Pruning of fruit trees. Attempts to “rat proof” Ralphs house with small chicken wire tunnels and the heated green house by fixing flashing around cinderblock bed supports. In addition to limited harvesting we had Tomato sauce and eggs available at market. Handling 18 hours: Products were cleaned and preparation forHopewell market. Special Projects 30 hours: Agricultural venture called Blackbird Meadows headed by third year intern. Primary special project efforts remained focused on the chickens. Week 3: Overcast and cold, some rain. Week 4: Wind, rain, cold and snow.